If you're going to accept credit cards, start by going through the online payments setup process. Your Populi account administrator goes to Account > Customizations and checks Yes to enable Bookstore (only after Step 1 is completed). You add items and test out a few sales processes to get ; afterwards, you start taking orders! If you wish to accept credit cards and use Bookstore's shopping cart features, a Financial Admin user must complete the online payments setup process in Financial > Settings > Online Payments. Enter https://yourschool.populiweb.com/bookstore/admin/settings.php (replace "yourschool" with your school's unique Populi site abbreviation) directly into your browser. Scroll down to the Enable Bookstore setting; click the Bookstore link. Click either Go to Bookstore settings (under the Bookstore disabled message) or Settings (in the left column under Setup). Check the payment methods you wish to accept for bookstore purchases. Credit Cards will be automatically selected after you've set up one or more payment gateways in Financial > Settings. If you're not taking credit cards, then your shoppers will not be able to use your online shopping cart—but you'll be able to make sales through Bookstore > Point of Sale. Several US states require the merchant to pay sales tax on the total order amount, including shipping. Look into your state regulations and check this box if you are required to do so. Your customers will see this message on the Home tab of your Bookstore. You can use text formatting in the greeting. Enter the income account number (from your Chart of Accounts) that you wish bookstore purchases to affect by default (this can be overridden for individual items). Enter the liability account number (from your Chart of Accounts) in which you wish sales tax charges to be recorded. If set, sales tax will be automatically split out from actual Bookstore purchase income. If blank or invalid, the entire amount of all purchases will be recorded as income in the default income account. Does your accountant use the first-in, first-out (FIFO) method, or last-in, first-out (LIFO) method for calculating the value of bookstore inventory? Select the asset account in which you will track the value of your unsold inventory. The balance of this account will be calculated according to the method you choose in the Inventory cost flow setting. Select the asset account in which you will track the value of inventory purchases. Select the expense account in which you will track the value of inventory shrinkage. The balance of this account will be calculated according to the method you choose in the Inventory cost flow setting. Select the expense account in which you will track the cost of goods sold. The balance of this account will be calculated according to the method you choose in the Inventory cost flow setting. If you wish (for what it's worth, we strongly recommend this! ), enter an email address (or multiple addresses, separated by commas) to receive order notifications. If you use a third-party fulfillment service, enter that email address here. Enter the income account number (from your Chart of Accounts) in which you wish bookstore shipping charges to be recorded. If set, shipping charges will be automatically split out from actual Bookstore purchase income. If blank or invalid, the entire amount of all purchases will be recorded as income in the default income account. Select a fee to which Bookstore can pin any shipping charges on an order that a student charges to his account. We heartily recommend setting up a unique fee for this purpose ("Bookstore Shipping", f'rinstance). This is helpful if you have a barcode scanner or credit card reader attached to your computer. Enter the maximum amount (in dollars) that students may charge to their accounts (that is, to roll their Bookstore purchase amounts into their regular Populi invoices). Only fill out this option if you're using credit cards as a payment option! What is your state sales tax (or Canadian VAT) rate? Select a fee to which Bookstore can pin any Sales Tax charges on a Bookstore order that a student charges to his account. We heartily recommend setting up a unique fee for this purpose ("Bookstore Tax", f'rinstance). List all states in which your institution has a physical presence. Enter the standard State abbreviations (TX, MN, IA, etc. ), and if more than one, separate them with commas. Customers with billing addresses in the states listed will be required to pay sales tax on their purchases. Leave this field blank to make tax apply to all states. Some states allow local governments (city, county) to impose additional sales taxes for online purchases shipped to those ZIP codes (North Carolina, for example). Enter the ZIP code and additional sales tax percentage. Additional fields will appear. If you don't need to enter any more ZIP codes, leave the last one blank. Click X to delete a ZIP code from the list. Getting your Bookstore ready for your customers involves setting up items like shipping, discount codes, return reasons, and, of course, adding items to your inventory (so you have something to sell!). This article covers shipping, discount codes, and other such things. This article covers items and inventory. Your school's Populi account admin must go to Account > Customizations to check this setting. Once checked, your Bookstore is active and ready to accept orders. Until you do this, your Bookstore will not accept any orders. After logging back in, Populi will do a few new things. 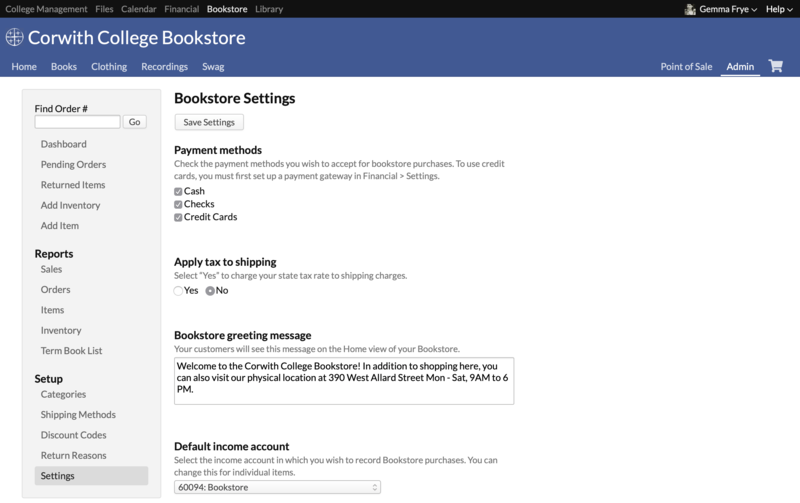 The top-level navigation (College Management & Financial) now also shows the Bookstore link. ISBN's establish links between courses and your Bookstore. If course instructor includes the ISBN in his reading list entry, and you've entered the same ISBN for a bookstore item, students can link directly to the Bookstore from the course and find those reading list items for purchase. After entering the set up information and clicking save settings, the screen just goes blank until I refresh. Not sure if that is supposed to happen, but would make more sense for the settings page to just reload automatically after you save. I just checked your account and found a permissions problem - it's been fixed, and you should now be able to edit all the bookstore settings! "Does your accountant use the first-in, first-out (FIFO) method, or last-in, first-out (LIFO) method for calculating the value of bookstore inventory?" Yes I Do and the FIFO works fine when tracking sales however the value of inventory is calculated using an average cost not FIFO which is causing a lot of complications at year end when we want a value of the current inventory on hand that should be based on the FIFO numbers.